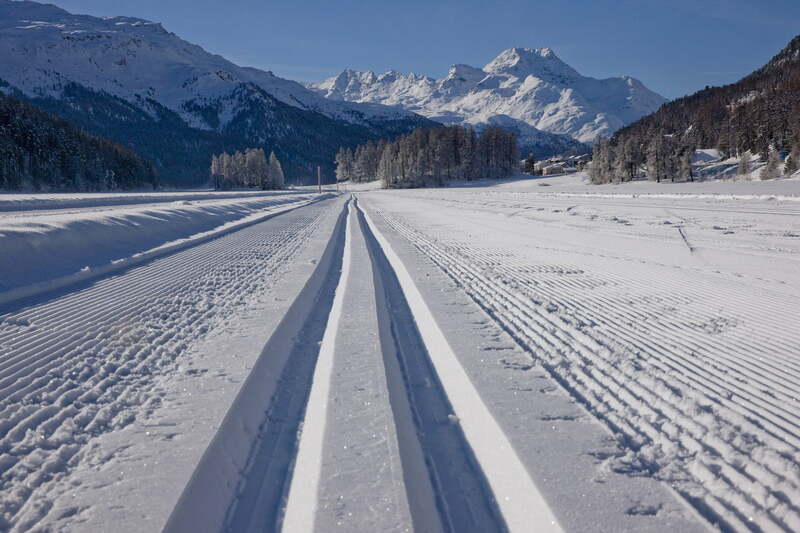 The Upper Engadin is heaven for cross-country skiers, with its superb combination of attractions: an exceptional variety of spectacular landscapes, trails of outstanding quality, and an unrivalled snow guarantee. Those looking for a gentler outing opt for the Direttissima across the three lakes, or enjoy one of the longest loops in the Engadin near Zuoz. More ambitious skiers train on the legendary Marathon route, the 42 most famous kilometres of trail in Switzerland (26 miles), tackle the picturesque side valleys or do their circuits on the racing route near St. Moritz, where they can stretch out their fitness sessions until late in the evening. 15 trail machines ensure perfect conditions every day. A map, as well as information on the cross-country ski trails, the snow conditions and cross-country ski courses, are available from the local tourist offices. The trails are kept in perfect condition by 15 tireless maintenance staff, who cut and clear the parallel grooves early in the morning or late at night. We appeal to locals and visitors alike to make a financial contribution towards maintaining these trails.